Fashion: Soft, comfortable and flowy blouse with crow neck. 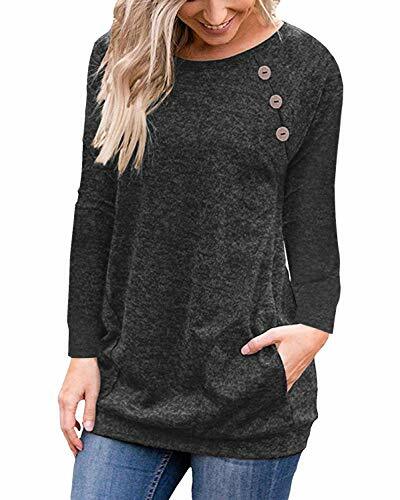 It’s a long sleeve blouse with fashion side button. Fabric: 75% Polyester 25% Cotton high quality material will give you a comfortable felling. Pinup Angel is an international online fashion and beauty retailer, we all the time strives to provide ladies with something stylish and charming in clothing and other accessories. Our products are featured with fashion blouse, dress, swimsuit, and so on. You are going to all the time find something pretty suit for you or your family. We have our own size, please follow our size below. Size S: Bust 92cm/36.22inch, Sleeve 67cm/26.38inch, Length 66cm/25.98inch. Size M: Bust 97cm/38.19inch, Sleeve 68.5cm/26.97inch, Length 67cm/26.38inch. Size L: Bust 103cm/40.55inch, Sleeve 70cm/27.56inch, Length 68cm/26.77inch. Size XL: Bust 109cm/42.91inch, Sleeve 71.5cm/28.15inch, Length 69cm/27.17inch. If you have any problem, please cntact us to begin with about your concerns. We commit to give you the most efficient product and service. Fashion: Soft, comfortable and flowy blouse with crow neck. It is a long sleeve blouse with fashion side button. Fabric: 75% Polyester 25% Cotton top quality material will provide you with a comfortable felling.